(email: l.gilbert@thegrid.net) Photos courtesy of author. This article is from the Spring 1998 issue of the International Calculator Collector, Issue #20. By the time electronic calculators began to appear in the mid 1960s, Olivetti had established itself as a manufacturer of innovative, stylish office machines, pioneering several designs of typewriters and electro-mechanical calculators. During this pre-1960 period, bulky internal parts and electronic components more or less dictated the appearance and size of the outer casing of the machine. Still, Olivetti's reliance on creative designers such as Marcello Nizzoli (designer of the classic Divisumma 24 mechanical calculator) and Ettore Sottsass (designer of the revolutionary Valentine typewriter) produced machines that stood out from the competition. An enduring characteristic of Olivetti machines that began during this period was the use of color and grouping of the various elements to achieve functional simplicity and aesthetic appeal. In the 1960s, miniaturization of electronic parts and continuing development of plastics and other materials such as aluminum, afforded the designer much greater freedom in designing products such as calculators. One such designer, trained as an architect, and hired by Olivetti in the early 60s, was Mario Bellini. Bellini developed his first calculating-related device for Olivetti, the CMC7 Magnetic Character Encoder, in 1963, followed by the Programma 101 desktop computer (the world's first electronic desktop computer), and went on to design Olivetti's calculator lines into the 1980s. The following discussion focuses on Bellini's major calculating machine designs, many of which are icons that inspired numerous imitations. Programma 101 (1965): Though not strictly a calculator, the P101 computer embodies a design philosophy that permeates all of Bellini's work: the use of sculptural shapes and new materials to evoke an expressive quality of the machine and stimulate an emotional response on the part of the user. The P101 is covered in cast aluminum, which can easily be curved into organic shapes, consists of numerous anthropomorphic references, such as a tongue-like projection on which the keyboard sits and gill-like slats on the side of the machine, and contains Bellini's first use of a stretched membrane. The stretched plastic membrane was Bellini's solution to the problem of integrating the square base of the key to the circular top. This gently-sloping, tent-like appearance of the keys contributes greatly to the elegant look of the machine. Logos 50/60 (1972): In the late 60s, Bellini experimented further with the stretched membrane concept, and flirted with both Minimalism and Pop Art in designs of video display terminals, televisions, and stereo systems. (It should be mentioned that although Olivetti was Bellini's major client, he was also commissioned to design products for other companies.) For his first true calculator project, however, Bellini turned to a more conventional aesthetic source, the lectern, to produce a desktop printing calculator with an extremely angled wedge design that would be easy to operate by a user. Subtle use of the stretched membrane and precise arrangements and color coding of keys resulted in a very clean-looking design. The keys are color-coded at the base while the tops of the keys are the same color as the body of the machine. The keyboard is recessed flush with the surface of the body, thus accentuating the unity of the whole machine. Divisumma 18 and 28 (1973): The Divisumma 18 (see photograph at the top of the page) marked a radical development for Bellini. His intention was to produce a technological product that was totally humanized, almost playful, and that invited human touch. Olivetti in 1969 had already developed the bright-red Valentine portable typewriter, designed to be "taken to the countryside by Sunday poets". Likewise infused by the Pop spirit of the age, the Divisumma 18 is unlike any calculator before or since. The bright yellow ABS plastic is covered by a yellow rubber "skin" that stretches over virtually the entire unit, and that gives it a soft appearance and feel. The rubberized keys depress and click with a springiness that is solid but fun at the same time. The underside of the calculator consists of three rounded tube-like pieces that run the width of the unit. Olivetti clearly intended to market this to a new breed of consumer. Advertising images showed a young businessman with modish hair walking in the open air under a blue sky clasping one of these units in his hand, the vivid yellow contrasting strongly with the dark suit. The Divisumma 18 is a true period icon, appearing in many books that discuss landmark 20th century designs [and is included in the Featured Hand-held Calculators section of this site]. The Divisumma 28 is a desk-top companion to the 18. It uses the same rubber membrane, only now in a more subdued gray. The inclined plane is used once again, except now the upper segment is completely rounded. Like the 18, it is a printing-only unit. And both are exceedingly difficult to find now, particularly the Divisumma 28. These radical designs appealed to only a small segment of the population, and producing the rubberized keyboard proved too costly for mass production. Logos 40,41, and 42 (1977), 80 (1978): In 1974, Bellini broke away completely from the Pop aesthetic and produced a cassette deck for Yamaha that was startling in its originality. Another severely angled product (like the Logos 50/60), this machine, with its black coloring, numerous slide controls, and level meters, was stark and full of precisely arranged elements. This "control panel" look, along with increasing miniaturization, led to the Logos 41,42, and 80 calculators. The calculator was now housed in a charcoal gray box that was split into two planes separating input and output. The unit could be purchased with or without a built-in electronic display (green fluorescent); those with the display had "PD" appended to their model numbers. They may have been Olivetti's first units with a display. In many ways, these models anticipated the "high tech" style that would dominate the design of consumer electronic products from the late 70s until fairly recently. Divisumma 33 (c. 1977-1978): A more compact version of the Logos models mentioned earlier (especially the 50/60), this model shows off the color coding better and has less severe angles. The calculator is a soft beige color as are the tops of the keys; the left-side operation keys (some of the basic arithmetic operators) have a blue base, the number keys have a gray base, and the right-side operators (+, -, grand total, subtotal, and so forth) have a coral base. Above the keys are a series of slide controls. Interestingly, the Olivetti publication referenced below does not mention this model, but instead refers to a Divisumma 35 and 37PD. Logos 3 and 7 (1978): This was Olivetti's first "pocket" calculator. The Logos 7 had a fluorescent display in addition to printing capability; the Logos 3 was printing-only. Bellini incorporated the shape of the Lexikon 82 typewriter (1972). The sides of the calculator are fully rounded while the top and bottom edges are straight; the intention is to facilitate removal from the carrying case. 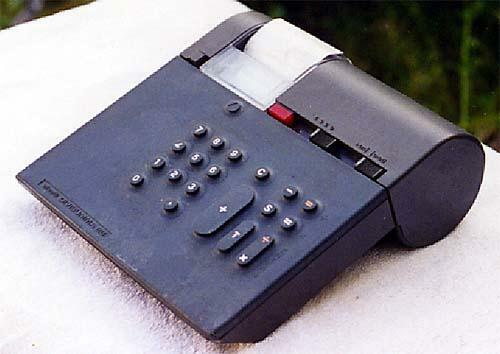 Bellini, always enamored of the wedge shape, incorporates it subtly into the keypad design, while the upper, printing part is flat. The result is a unique, but somewhat bulbuous appearance. Logos 9 (1981): Olivetti's first LCD model (actually the only one I'm aware of); it was the world's smallest printing calculator at 4.5" x 2.5" x 1". In addition to the basic four functions, it calculates averages, totals, percentages, and the time. The printing mechanism disappears from view when the display section is closed up against the keypad section. A sleek, spare, professional-looking unit, this model is one of the great examples of minimalist design. In the 1980s, Olivetti produced more printing units, some with fluorescent display, such as the EC 162, Logos 182, and other models with 3-digit model numbers. Some of them appear to have been marketed under the Underwood name. Because of further miniaturization and greater use of non-impact printing technology (especially ink-jet), these calculators are thinner and lighter and frankly less interesting to my eyes. Mario Bellini's products inhabit major design collections, such as that of the Museum of Modern Art in New York. In his affiliation with Olivetti, he created calculators that are the pinnacle of consumer electronics design in the 1970s and represent the major trends of that period: the Divisumma 18 (pop). Logos 40 series (high tech), and Logos 9 (minimalism). Design Process: Olivetti 1908-1983. published by Olivetti on the occasion of its 75th. anniversary, 1983. Mario Bellini, Designer. Cara McCarty, The Museum of Modern Art, New York, 1987. The International Calculator Collector [ISSN 1078-1390] was the official journal of the International Association of Calculator Collectors. All contents are © 1998 IACC. Unfortunately, the IACC is no longer operating.